Wonder Woman is Finally Here! Wonder Woman is finally in theaters this weekend! 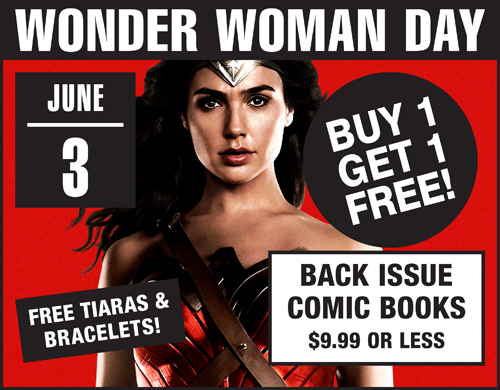 On Saturday June 3rd, we’ll be celebrating Wonder Woman Day at Slackers with a special sale and free tiara & bracelet sets. Swing buy to pick up some comics and snag your tiara and bracelets to wear to the show on Saturday! Buy 1 Get 1 Free on all Back Issue Comics regularly priced $9.99 or Less! Cannot be combined with any other offer. Subject to manager approval. Some exclusions may apply. See associate for details. No dealers. The lesser of the items is free. Visit Slackers on Wonder Woman Day to receive a free Wonder Woman bracelet & tiara set courtesy of DC Comics! See associate for details. One set per customer, please.